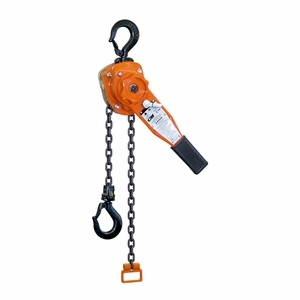 The Series 653 line of lever hoists is one of the most popular on the market. Designed and manufactured by CM these hoists are based on user-friendly features and durability. The handle is short yet requires minim pull effort, so you can lift heavy loads in tight spaces. Its durable frame and gear case cover are made from impact-resistant stamped steel, which also helps keep the weight down. Other great features include hardened steel load sharing gears, a Weston type load braking system and a rubber grip handle for ergonomics. One-handed operation is possible when the hoist is in "free wheel" mode, which means you can rig up quickly and easily. Designed to be relatively maintenance-free (no special tools required) with a 5-year warranty against defects in materials and workmanship.